Lister Notes The following Listers have special circumstances. Please be mindful of these circumstances before sending them a gift, as they may not be able to pick it up at certain times. WEEKEND PLAYERS These players have informed us that they are weekend players: This means that they rarely, if ever, are able to get on from Monday-Friday. Please limit your gifts to them to the weekend unless you are willing to hold it until they can see. -wecwish SHORT VACATIONS These people have informed us that they will be on a short vacation (less than 10 days); please refrain from gifting these players during their vacation. Any vacation longer than 10 days should be informed to us about via a removal from list form. Dusky_Flareon will be inactive from 9/24 to 10/1 so please understand if they do not respond to PM's during this time. --------------------------------------------------------------------------------------------------- UPDATING Anything after this post will be put on the next update. This update is to take all the hanging threads left over from the original post. Dawnfur, You have been added to the Black and Nebula lists. Miraxzee, You have been added to the tri-horn and tsunami lists. dellessa, You could not be added to any lists because your links are not clickable. Please make them clickable and request again. Dimar, You have been added to the Black and Harvest lists. loire, You have not been added to the Seasonal list as it is full. please wait for an opening and request again. Shienvien, You have been added to the Tsunami and Lumina lists Onixthebunny1, You have been added to the Red list. KaelaBoo24, You have been added to the nebula list with preference blue. Remember that should the list fill up, you may be removed if someone without preferences asks to be added. Woof123Albinos, you have been added to the Gold horned tangar, Lumina, Tri horn Wyvern, Two headed, Olive and Moonstone lists. Lolchen, you have been added to the black and red dino lists. Hydraulics22, you have been added to the chicken, paper, night glory and day glory lists. sparkle10184, you have been added to the green dino and red dino lists. Rai-Wolf, You have been added to the thunder, nebula, ember and magi lists. Aeres, You have been added to the black, royal blue, tsunami and tri-horn lists. InariRoku, YOu have been added to the white, Bright-Breasted wyvern and sunrise lists. However, the black list is full. please wait for an opening and request again. Also, as there is a preference on your sunrise, should the list fill up, and a person without a preference requests, you may be bumped. Removal from Lists: Dimar, You have been removed from the horse and spitfire lists. LauraJae, You have been removed from the vampire list. Fire-Ice, You have been bumped from the red list due to an unpreferenced request. The Following Lists are Now Full. Please wait until there is an opening and ask to be added then: -Purple Dino -Gold -Blusang -Golden Wyvern -Tan Ridgewing-1 spot open if no preference -Vampire -Seasonal -Striped -Silver -magma -red -ice -thunder -nebula-1 spot open if no preference -black Gifts Given: wbmorgan>laurajae>vampire egg Lolchen>Dimar> swallowtail egg hopeitallaway>sei_chan65>tri-horn wyvern egg Edits: The Sunrise and Sunset lists have been combined as you cannot tell the difference in any way from the egg which it will be. It is completely determinate on the requester. Therefore, specifics will be considered preferences. Also @ Lolchen, you may still ask for the nebula, despite the total amount on your scroll, as they are not a rare. We only have limits on Rares because they are much harder to catch than the others, and to ask for someone to continuously search for those for you is not right. You are perfectly able to ask for the nebula, red would just be a preference added to the end of the request. And yes, the differences posted are only posted because you can see the difference in the egg, which is why the Nebulas are all posted together, unlike the Dorsal and dinos, and can be caught at any time, unlike the different glory drakes [you can tell what it'll be from when it is caught]. Hope that helps! Any more questions just post or PM and we'll get back to you! Uncommons There are TEN(10) spots on each of these lists, no more. You may be added up to FOUR of these lists. Black 1.SaphireKat-Scroll-9/4/16 2. Black-Capped Teimarr Black Tea Blacktip Blusang 1. Datdragontho-Scroll-8/8/16 2. bonvoyage-Scroll-Preference female-8/8/16 3. dragonheart1999-Scroll-8/8/16 4. HeartJacker13-Scroll-Preference female-8/10/16 5. UltimateBassDrop-Scroll-8/8/16 6. Candelabra Celestial Copper-Liver of Sulfur/Brown 1. Asketil-Scroll-8/8/16 2. SkinDrake-Scroll-8/8/16 3. dragonheart1999-Scroll-8/8/16 4.WoLfgIrLyS-Scroll-9/4/16 5. Copper-Rainbow/Orange/Red 1. Ayumi_Seto-Scroll-8/8/16 2. dragonheart1999-Scroll-8/8/16 3. Jadeye-Scroll-8/9/16 4. aisudesu-Scroll-8/10/16 5. SerasVahe-Scroll-9/5/16 6. Copper-Verdigris/Blue/Green 1. Asketil-Scroll-8/8/16 2. Dusky_Flareon-Scroll-8/10/16 3. Amaterasu-sama-Scroll-Permission granted to hide scroll-8/10/16 4. bonvoyage-Scroll-Preference male-8/8/16 5. dragonheart1999-Scroll-8/8/16 6.IndigoTheCat-Scroll-8/8/16 7.diablokitty-Scroll-8/15/16 8.WoLfgIrLyS-Scroll-Preference Male-9/4/16 9. Dorsal-Red 1. diaveborn-Scroll-8/8/16 2. vi_obsession-Scroll-8/15/16 3. Ember Gemshard 1. Rainstar13-Scroll-Preference Jade male-8/8/16 2. SkinDrake-Scroll-8/8/16 3. SilverDarkness-Scroll-8/8/16 4. HeartJacker13-Scroll-Preference red-8/10/16 5.diablokitty-Scroll-8/15/16 6.miendi1120-Scroll-8/21/16 7.WoLfgIrLyS-Scroll-Preference Blue Female-9/4/16 8. Gilded Bloodscale Glory Drake-Day Glory Drake-Night Golden Wyvern 1.miendi1120-Scroll-8/21/16 2.SaphireKat-Scroll-Preference egg or Female hatchling-9/4/16 3. Gold-horned Tangar Harvest Hellfire Howler Drake Lumina Lunar Herald-Bronze/Brown Lunar Herald-Gold 1.vi_obsession-Scroll-8/15/16 2. Lunar Herald-Indigo/Blue 1.diablokitty-Scroll-8/15/16 2. Lunar Herald-Silver/White 1. Dragnilu-Scroll-8/8/16 2. diablokitty-Scroll-8/15/16 3. Magi Nebula 1. GoldeenTrix-Scroll-8/8/16 2. Dusky_Flareon-Scroll-Preference non-green hatchling-8/10/16 3. FAstudent12-Scroll-Preference Purple Hatchling-8/8/16 4. Yukimura_Ai-Scroll-Preference Hatchling-8/16/16 5. Nexus Pillow Pink 1. a5t00-Scroll-8/8/16 2. bonvoyage-Scroll-Preference female-8/8/16 3. Dragnilu-Scroll-8/8/16 4. Pyralspite-Almandine 1. SilverDarkness-Scroll-8/8/16 2. Pyralspite-Pyrope Pyralspite-Spessartine 1. SilverDarkness-Scroll-8/8/16 2.bonvoyage-Scroll-Preference female-8/8/16 3. Red 1. Rainstar13-Scroll-Preference hatchling-8/8/16 2. Dragnilu-Scroll-8/8/16 3. Dusky_Flareon-Scroll-Preference hatchling-8/10/16 4.SaphireKat-Scroll-preference egg or male hatchling-9/4/16 5. Ridgewing-tan 1. UltimateBassDrop-Scroll-Preference egg or gendered hatchling-8/8/16 2. Royal Blue Royal Crimson Seasonal Seragamma Wyvern Speckle-Throated Spirit Ward 1.Dragnilu-Scroll-8/8/16 2. Striped -White 1. SkinDrake-Scroll-Preference ALL Hatchlings preferred-8/8/16- 2. a5t00-Scroll-8/8/16 3. Arakaari-Scroll-Preference male-8/8/16 4. Sunrise/Sunset Sunsong Amphiptere Swallowtail Tri-horn Wyvern Tsunami Wyvern Two-headed/Split Two-headed Lindwurm/Opal Undine Vampire Vine White 1. a5t00-Scroll-8/8/16 2. Dusky_Flareon-Scroll-Preference Male Hatchling or Influenceable Egg-8/10/16 3. Xenowyrm-Astrapi 1. GoldeenTrix-Scroll-8/8/16 2. Jadeye-Scroll-8/9/16 3. miendi1120-Scroll-8/21/16 4. Xenowyrm-Chrono 1. CowlRaven-Scroll-8/8/16 2. Ayumi_Seto-Scroll-8/8/16 3. Amaterasu-sama-Scroll-Permission granted to hide scroll-8/10/16 4. Xenowyrm-Gaia 1. Jadeye-Scroll-8/9/16 2. WoLfgIrLyS-Scroll-Preference Male-9/4/16 3. Xenowyrm-Mageia 1.Ayumi_Seto-Scroll-8/8/16 2. Jadeye-Scroll-8/9/16 3. Amaterasu-sama-Scroll-Permission granted to hide scroll-8/10/16 4. Xenowyrm-Pyro Xenowyrm-Thalassa 1. Ayumi_Seto-Scroll-8/8/16 2. miendi1120-Scroll-8/21/16 3. Links Gifts Recieved Donor Honor Roll [over 20 gifts] Past Updates Original thread Banners: If you would like to help us out by advertising, feel free to use any of the following banners! If you would like to create a banner, just send it to me through a PM with its IMG link, or post here with its code and I'll get it put up! By Vampiresswolf: [url=http://forums.dragcave.net/index.php?showtopic=145537][IMG=http://i881.photobucket.com/albums/ac13/sunnyhatesyou/Caveborn%20Gifters/banner1_zps2f0c9666.gif][/url] [url=http://forums.dragcave.net/index.php?showtopic=145537][IMG=http://i881.photobucket.com/albums/ac13/sunnyhatesyou/Caveborn%20Gifters/banner2_zpsdcde0efc.jpg][/url] [url=http://forums.dragcave.net/index.php?showtopic=145537][IMG=http://i881.photobucket.com/albums/ac13/sunnyhatesyou/Caveborn%20Gifters/banner3_zps0a3033fb.gif][/url] By Red2111 [URL=http://forums.dragcave.net/index.php?showtopic=145537][IMG=http://i83.photobucket.com/albums/j320/Red2111/misc/DC%20Lineage%20Project%20banners/1-1_zps54511423.gif][/URL] By Nazgod [URL=http://forums.dragcave.net/index.php?showtopic=145537][IMG=http://oi49.tinypic.com/2v9t93o.jpg][/URL] By SnitchMist2210 Size 1: [URL=http://forums.dragcave.net/index.php?showtopic=145537] [IMG=https://i.imgur.com/8vUhplHt.jpg][/URL] Size 2: [URL=http://forums.dragcave.net/index.php?showtopic=145537] [IMG=https://i.imgur.com/8vUhplHm.jpg][/URL] By Tomato_Juice [url=https://forums.dragcave.net/index.php?showtopic=145537][img=https://i.imgur.com/YkSKaUV.jpg][/url] Announcements -June 24, 2014- We have openings for both Primary and Secondary Mods up. If you would like to be a part of our Moderation family, please fill out the appropriate form and send it via Messages to us. Thank you! Also, all new dragons have been added appropriately. Last but not least join me in saing goodbe to one of our secondary mods, who will now be placed on the Silver Plaque, XiaoChibi. -January 3&4, 2014- WE HAVE OPENINGS FOR 2 PRIMARY TOPIC MODS: please use the form above and send in your application! Also, thank you to lollipop00, who has served well as a mod, and will have a place on the Silver Plaque. Added dragons to the lists: Nhiostrife, Yellow-Crowned, Red-finned tidal, Imperial Fleshcrowne, and Duotone dragons have been added to the Commons list. Bleeding Moon and Two-headed lindwurm dragons have been added to the uncommons list. Black dragons, due to their slight increase in availability have been downgraded to the uncommon list. Thank you to Arella, who pointed out that at some point our Whiptail list was deleted. As we are unable to determine the members who were a part of this list, it was placed back blank. Hellhorse dragons will not be added to the list, as they are breed only. Grave and Solstice dragons, as holidays, will also not be added to the lists. You may now feel free to ask for a spot on these lists. EDIT: It appears the loss of the whiptail was of no fault of ours, except for having neglected to notice that the post itself was becoming overcrowded. Due to this everyone that was on the lists Seawyrm Pygmy to Yellow-crested were cut off when the update completed. I will soon be going through to replace these lists, and do my best to recover the lost members. If you know you were on one of these lists, please write up a new add-to-list post and let us know. Thank you! The lists will soon be separated via the rarity, with the Rares in their own post, Uncommon in theirs, and Commons in theirs. Because of this, the other posts will have to be placed together. The Links, Banners, and Announcements will now be forced to share a post. Thanks for your cooperation! also, a certain something has been edited in the rules. Make sure to refresh yourself on them! -July 17, 2013- The Birthday releases have now been added to the list, all as uncommons. However, Hellhorses are not added due to them being breed-only. -May 24, 2013- Royal Crimsons added to the Uncommon lists. The Soulpeace dragons will not, due to being breed-only -April 19, 2013- I want to give a great big THANK YOU to everyone who applied for the Mod and Secondary mod positions. There were over 30 of you in all that applied for either Secondary or Primary mod, which gave me quite a lot to decide on, and you were all great applicants! Welcome me in congratulating our new Mod, and our three new Secondary Mods! New Primary Mod: RainStar13 New Secondary Mods: XiaoChibi, Zerhai, herobrine745 -April 12, 2013- Speckle-Throated dragons are now available to be asked for via this thread, under the Uncommons sector. The new April release is still unavailable [and for the Soulpeace, WON'T ever be, as it is a breed-only]. Also, a slight edit to the rules has taken place- If you posted a request and wish to request more, and it is on a rares list or a popular list, you need to make a new post so that you do not bump anyone from a spot that is rightfully theirs. -April 10, 2013- We say a teary farewell to our Mod QAndais, who has stepped down, and is now on the Silver Plaque list. Due to this, we are opening up the Moderator applications. If you wish to be a moderator, visit the first post and follow the Application rules, thanks! Also, we have opened a new position, called the Secondary Mods. These mods won't be in charge of updating, but they have a job that is just as important! There are two positions open for Secondary Mods, also available in the same place! -Close April 18, please have your applications in by then.- -Feb. 27, 2013- To distill confusion, the way in which the lists are posted has been amended for ease of access. Now the examples are ABOVE the code for their respective request, instead of below. -Jan. 28, 2013- Please welcome our new topic mod, lollipop00! In other news, no, the thread has not been updated yet, for the main reason there really isn't too much to update, HOWEVER, I (Vampiresswolf) now have internet again at my residence! So this should be remedied relatively soon! Thank you! -Jan. 19, 2013- I (Vampiresswolf) have moved for college reasons, and as I haven't internet, the updating will be slow. However, I am looking for one or two new mods to help, if you would like to become a mod visit the first post, it will tell you how to apply. -Jan. 8, 2013- Welcome to the new account! Hello and welcome to the Caveborn Gifters thread! 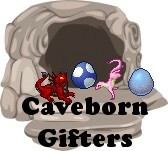 Here in this thread, we work to catch and trade gifts that are Caveborn, no bred eggs, just those captured from the cave. This is NOT a trading thread, and it is NOT a game of any sort. It is, as the description says, to gift and receive caveborns. ANYONE can give gifts via this thread. There is no Donator's list. Topic Accepted: Yes, by _Z_ Topic Contents: Post 1: Explanation of topic, rules, codes, FAQs, topic mods, bans Post 2: Major Announcements, Gifts Recieved and other links, and Banners Post 3: Rares Lister Post Post 4: Uncommons Lister Post Post 5: Commons Lister Post Post 6: Listers Special Circumstances and layover from previous thread WHY? This thread is up for the gifting of caveborns. It is here because on the other gifting threads, you may not expressly ask for a CB, which in turn causes many bred eggs to be gifted, and it is considered bad faith to refuse gifts, not to mention the fact that it is very unlikely a person with a CB egg will not know that this is the egg you want. It has no trading, as there is already a thread for trading, this is for asking to be placed on a list to receive a CB of a certain type. Here you may request certain CBs, whereas in the trading form you can only request with a already-caught CB you have, which doesn't work well with the rarer of the breeds, also these requests expire once the egg grows up. HOW? To be added to a list, you must follow the rules and use the appropriate code forms. You may only be added to 4 commons and 4 uncommons lists at one time, and only 2 rares lists at any time. You will be removed from a rare or full list once you have received a gift, to open up spaces for others. Steps to be added: -Post the correct code, fully filled out. -Wait for an update, when you will be added. -When you receive an egg or hatchling, you will be removed from that species list, and will need to wait to be re-added until after an update is complete [for Rares and full lists]. -Say thank you. -When giving or recieving a gift, in the PM please post a note letting the lister know that this is where the message came from. [ex: place CG in the title or somewhere in the message] NOTE: Don't ask to be added to any list that is full, even if someone asks to be removed from that list, until there is space on that list officially. For example, if the silver list is full, you may not ask to be added to it. If another person on the silver list asks to be removed, you still may not be added until there is an update freeing up the space. RULES! These rules can be amended at any time with no warning. Failure to comply with the rules will result in the consequences listed. Our rules have 4 consequence tiers- Insta-permaban, tempban, warning, and being removed from/not added to list(s). The severity of the consequence may also depend on the situation. For example, asking to be added to a full list normally gets you a warning. However, if an update hasn't been run in a while and it is difficult to discern what lists are full, you would not get a warning. Not complying with the following will get you a blacklisting: Any additional rule-breaking after a 3-week tempban will earn you a blacklisting. Do not park your gifts on other scrolls. This means do not move your eggs or hatchlings to any scroll that is not the one listed in your sign-up post. Not intend to kill, bite, experiment on, etc your gift, and do not intend to freeze it. If you wish to freeze, you must ask your gifter first. Do not trade away gifts you are given. Do not beg, harass, etc anyone on the thread. This is also against DC Forum rules and will get you reported to a Site Discussion and/or Global Moderator. Not complying with the following will get you tempbanned:3 warnings will earn you a tempban for 1 week. Any additional rule breaking will increase the tempban by 1 week, up to 3 weeks maximum. Do not ask for any lineages, as this is for gifting of Caveborns only. Do not ask to be placed on a non-existent list. Lists for new dragons will be added a few months after they are released, or whenever we see fit. If something bad happens to a gift you are given, immediately PM the gifter and a CBG primary mod about it. We understand sometimes real life gets in the way and bad things happen, but please try to let us know ASAP. We do not support public shaming therefore any complaints or problems with any other member should be sent via pm to the CBG project account (as well as to the person you have the problem with), and never on the thread. Not complying with the following will get you a warning:Post only for yourself when asking to be added to or removed from lists. You may not request for other people and other people may not request for you. Only ask to be added to a list if there is a free spot. No 'when open' requests. Even if someone asks to be removed from that list, you can not ask to be added until there is space on that list officially. For example, if the silver list is full, you may not ask to be added to it. If another person on the silver list asks to be removed, you still may not be added until there is an update officially freeing up the space. Preferenced listers count as 'free spots' if your request is unpreferenced. Be as specific as possible when asking to be added to a list, if you are not specific, you will not be added to a list. This means, no "and/or" requests, no "any trio" requests, etc. Please do not post in the thread with questions about when certain lists will be added, how you think rules should be changed, how you think list rarities should be changed, or any other questions/statements on how we should change the way the thread is run. We think this unnecessarily clogs the thread and should be PMed to the project account or CBG primary mods instead. Not complying with the following will get you removed from your list(s) or not added to any list(s):Keep your scroll visible at all times, even after having been added to a list. If you feel uncomfortable keeping your scroll visible, PM a CBG primary mod. You may ask to have a preference such as male/female hatchling and colour, in the case of dragons that come in different colours. However, you may be bumped from a list if someone who does not have a preference asks to be added when the list is full, even if you haven't received a gift. Use code formats, and fill them out completely- you will not be added to any list if they are not filled out properly. Everyone who is on a list will have the date of their addition to the list placed after their request. Those requests who reach 2 months in date will get an Activity Check sent to their mailbox. Those who do not reply in 48 hours as well as those who have a full mailbox will be removed. Those that reply will get a new date after their request. In order to cut down on the amount of activity checks needed, those who post in the thread will get a new date after their request during each update. You may be added to up to four uncommon, four common, and two rare lists at a time. If you wish to be on a different list, you must ask to be removed from one you are on. You will not be added to any new lists if you are at your limit. If you wish to be on a metallic Rares list, you can only be on either the Gold OR Silver list, but not both. If you are already on one, you will not be added to the other. You need not specify non-tinsel, as tinsels and other prize dragons are not available CB. You must have no more than 2 CB for Rares lists. Any requests for that rare after that will not be added. If you are on a Rares list, and acquire 2 CBs of that rare, you must post and ask to be taken from the list. We will be checking each of the Rares' members' scrolls for 2 CBs each update. No one on the Rares list may have dead things on their scroll. You will be removed as of the next update should there be any dead things on your scroll for any reason- this includes failed zombie attempts on Halloween. Zombies themselves are fine to have, though. If you read and understand the rules, and this is an even-day (0,2,4) please post your favorite real life animal under the 'Other' section of your sign-up post! If you request on an odd day, please do the same with your favorite DC dragon breed. Make sure to use DC time(EST)! The following are general guidelines and information on how the lists work. It is in your best interest to follow the guidelines, but there are no specific consequences for not doing so at this time.Let us know if you will be gone for an extended period [ex. more than 4 days], so that we may take you off a list. If you are a weekend player, please keep this stated in your request and on your signature or profile so that our gifters will know not to send gifts during the week. Someone must post that the gift was given in the thread in order for it to be recorded. Do not post the gifting twice. Make sure to post if it is an egg or hatchling, and not just the breed. Look a couple pages/posts above yours to make sure a space on the lists is still available. Do not double-post for any reason. Use the 'edit' tool found at the top of your post. However, if you already posted and wish to make a new request after other users have posted, you need to make a new post so that you do not bump anyone from a spot on a list that is rightfully theirs. If you believe that a person does not belong on a list, or has delayed a response to a PM, you can inquire to us and we will look into it. Please check if they are a weekend player or if they have any notices in their signature/profile that may explain their delay before you let us know. You will be removed from a list once you receive a gift on Rares lists or full common/uncommons lists. This is for flood control on the rarer and more sought-after species to give more people a chance at those lists. Codes! To be added to a list: I'd like to be added to a List! Forum ID: Vampiresswolf [The name YOU go by on here] Scroll Link: here or http://dragcave.net/user/Vampiresswolf [make sure it is a LINK, not just the words, also make sure it is yours.] PM Link: here or http://forums.dragcave.net/index.php?act=M...DE=4&MID=183763 [either work. However, make sure YOUR name is in the to box. see the FAQs if you need help finding this.] List Request: Silver, Thunder, White, Red, Pink, Vampire, Mint, Neotropical, Daydream, Green. [2 rares, 4 uncommons, 4 commons, at most] Other: [whatever else is needed.] [b][font=Curlz MT][color=red][size=7]I'd like to be added to a List! [/size][/color][/font][/b] [b]Forum ID: [/b] [b]Scroll Link: [/b] [b]PM Link: [/b] [b]List Request: [/b] [b]Other: [/b] To be removed from a list: I'd like to be removed from a List! Forum ID: Vampiresswolf [The name YOU go by on here] List to be removed from: Silver, White [whichever lists you want to be removed from] [b][font=Curlz MT][color=blue][size=7]I'd like to be removed from a List! [/size][/color][/font][/b] [b]Forum ID: [/b] [b]List to be removed from: [/b] To Update a list: I'd like to change a List! Forum ID: Vampiresswolf [The name YOU go by on here] List To Update: Red [the list you would like to update. If you want to be removed from one list and placed on another, use the other forms] How: Add female preference [or remove preference, or change preference to another gender] [b][font=Curlz MT][color=Green][size=7]I'd like to change a List! [/size][/color][/font][/b] [b]Forum ID: [/b] [b]List To Update: [/b] [b]How: [/b] To report a gift: I'd like to Report a Gift! Gifter [The person who gave the gift] > Giftee [the person who received the gift] >Gift: Breed Stage Gender[breed of gift, stage of gift, gender of gift if applicable] (sent/accepted) [sent for gifts that have not been picked up yet, accepted for those that have] [b][font=Curlz MT][color=purple][size=7]I'd like to Report a Gift! [/size][/color][/font][/b] [b]Gifter[/b]>[b]Giftee[/b]>[b]Gift (Breed Stage Gender)[/b] (sent/accepted) To Offer a gift in the Thread: I'd like to Offer a Gift! Forum ID: Vampiresswolf [The name YOU go by on here] PM Link: here or http://forums.dragcave.net/index.php?act=M...DE=4&MID=183763 [either work. However, make sure YOUR name is in the to box. see the FAQs if you need help finding this.] Breed of Gift: Vampire [self explanatory] Stage/Gender of gift: Male hatchling [Egg or hatchling, gender only if applicable] Other: [any other needed information, such as stipulations] [b][font=Curlz MT][color=orange][size=7]I'd like to Offer a Gift! [/size][/color][/font][/b] [b]Forum ID: [/b] [b]PM Link: [/b] [b]Breed of Gift: [/b] [b]Stage/Gender of gift: [/b] [b]Other: [/b] FAQs How do I find my PM link? If you have posted before, there is a link under your post that says PM, click on that, and then take the URL from that page. If you HAVEN'T yet posted, click on your name at the top of the screen and go to your profile. On there, in the top right-hand box, there will be an option to PM. Click that link, and then take the URL from the new page. What is my Scroll link and how do I get it? The scroll link is the public link for people to get to your scroll. It is found at the top of your scroll in a little box that says 'If you would like to show your scroll to others, give them the following link:' How many lists can I be added to? The total would be 10, if you wished to max out your requests. Four commons, four uncommons, and two rares (as long as you had less than 2 CB of the requested rare). Why was I not added to a list? If you have not been added to a list, it may mean that that list is full, you already have two or more CB of a requested rare (for Rares lists), or something was incorrect in your signup post. Make sure you read the rules all the way through, make your links clickable, and do all else that it says. If you are unsure as to why you were not added, and you have gone through all of these (check the last Update, usually it will say), contact a mod. Why Is *such and such a dragon* here and not there? I think you should move them to there...etc How we determine the rarity of the breeds is up to us. Please do not tell us how to run our thread, as much research went into the placement of the individual dragons. Why is Shallow Water/Ultraviolet/Bluna/Geode/Alternates/etc. Not on the list? Because they cannot be found caveborn. Therefore, these and other breed-only breeds are not added as this is a Caveborn [aka catching] thread, not a breeding thread. Vampires are on the list because it IS possible to catch them Caveborn, not all vampires are bitten, there are some that come from the biomes, and bitten CBs of other breeds are considered Caveborn as they have no lineage. For an example, this Vampire was caught in 2012 (not in the Halloween release of '09), and was not bitten. A CB bitten vampire would be in example here. Both of these would be considered Caveborn. Why are some of the breed names small, gray, and have no list spaces? The lists where the breed names are smaller, gray instead of blue, and do not have any spaces after them are completely empty; there is nobody currently requesting those breeds. Don't worry, you can still ask to be added! This is just to keep the lists cleaner and more compact. Thread Mods These people are in charge of updates and the running of the thread, to PM them click on their name. To PM questions or other concerns, please PM through the CBG account. Thanks! Vampiresswolf-Founder (inactive) RainStar13-Top Mod dragonheart1999 Sphyion heyninja Secondary Topic Mods These people are in charge of going through the Rares listers to make sure they are up to code and generally helping the Thread Mods. herobrine745 Silver Plaque These are previous mods and people that will always hold a special place in our hearts. QAndais lollipop00 XiaoChibi Zerhai SuperCream Stellaluna22 Mod Applications are CLOSED for now. Thank you for all your interest. Primary Topic Mod Application: [b]Username[/b]: [b]How long have you been on Dragon Cave? [/b]: [b]How long have you been on the forums? [/b]: [b]What is your PM link? [/b]: [b]What is your Scroll link? [/b]: [b]Why do you want to mod here? [/b]: [b]How do you believe you can help? [/b]: [b]How often could you get on to update? [/b]: [b]Are you willing to update as regularly as possible and to communicate with your fellow mods, as well as answer questions as needed? [/b] [b]How many other places have you/are you modding at? [include links if possible][/b]: [b]To show you know how to code correctly and would be able to post as we post, please show a mock-update [In other words, go through and do an update on the list itself, using at least 10-15 posts, so that you know what you are getting into, and if not all codes are used, make some up][/b]: Secondary Mod Application: As a secondary mod, you would be in charge of going through the Rares listers' scrolls to make sure they have not achieved more than 2 CB of their breed, as well as making sure they have not got dead things on their scroll. You need to do this as often as possible, but missing a week or two is not a horrible offense. Should you be chosen as a Secondary mod, you will be given the URL links to the needed pages, as well as the code for a format we would like for you to follow. You would fill out the code and send it to the Caveborn Gifter's account each time you check the thread, but you will not be given the access password for the account itself. You will be a very important part of the running of this thread. [b]Username[/b]: [b]How long have you been on Dragon Cave? [/b]: [b]How long have you been on the forums? [/b]: [b]What is your PM link? [/b]: [b]What is your Scroll link? [/b]: [b]Why do you want to mod here? [/b]: [b]How often could you do your duties? [/b]: [b]Are you willing to update as regularly as possible and to communicate with your fellow mods? [/b]: Send the appropriate form, filled out, to the Caveborn Gifter's inbox. DO NOT post it here, as we will not be looking for it. Bans Everyone is allowed three warns before being tempbanned for 1 week. If you break additional rules, you will get a 2 week, and then a 3 week tempban. Any rule-breaking after that will get you permabanned. Those banned are recorded for future rule-breaking use. Certain rules being broken can result in an insta-tempban or an insta-permaban with no warning. Bans are recorded privately in a document along with warns; if you are warned or banned you will be PMed by this project account to let you know.